The fun Trail Twist 3 wheel Scooter is perfect for younger kids. 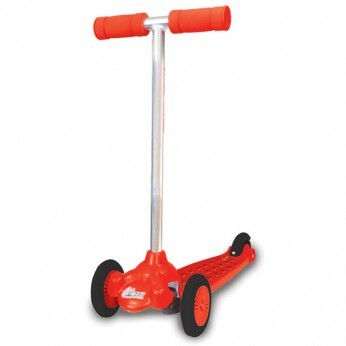 This fixed height scooter incorporates an easy-steer mechanism, making it easy to manoeuvre left and right. The Trail Twist has a rear brake, removable soft handle grips and decals. Choose from 2 colours pink or red. Maximum weight 20kg. Dimensions: 68H x 60L cm. Recommended age 3 years +…. This toy costs approximately £14.99 (for the latest and best prices make sure you check our retailer list for the Twist Scooter Red above). In our review of Twist Scooter Red we classed it as being suitable for ages 3 years, 4 years, 5 years but recommend you check the manufacturer specific advice before purchasing.